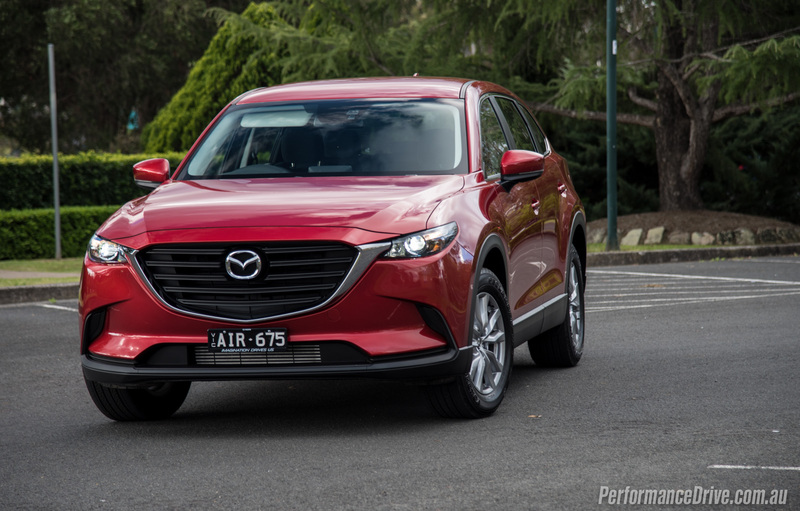 Although small and medium SUV sales are surging in Australia, having both eclipsed small and medium cars, large SUVs are still very much hot property meaning the 2016 Mazda CX-9 has to be just right. Its predecessor bowed in 2008, on a Ford platform, using a Ford V6 engine. 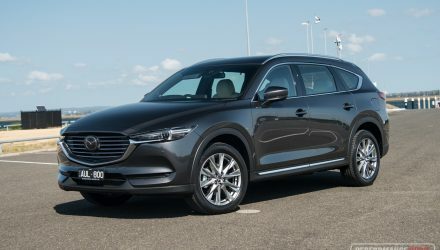 Heavy and thirsty, sales dwindled in Australia as diesel alternatives highlighted the CX-9’s shortcomings to customers. 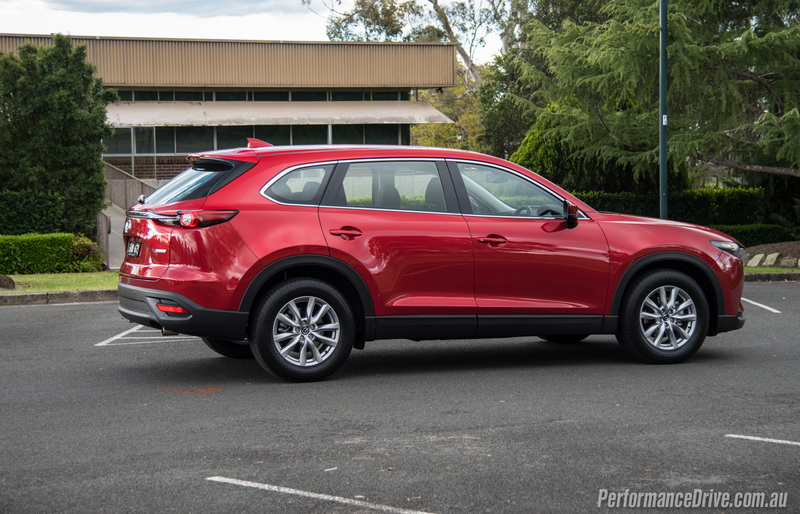 The CX-9 has always been primarily targeted at the American market, and the new model is no exception. 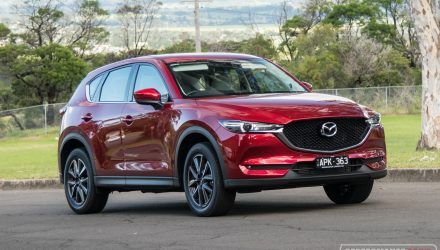 It rides on an all-new platform between 90-130kg lighter in weight, a downsized and turbocharged engine promising markedly improved average economy of 8.4L/100km (FWD) and 8.8L/100km (AWD). 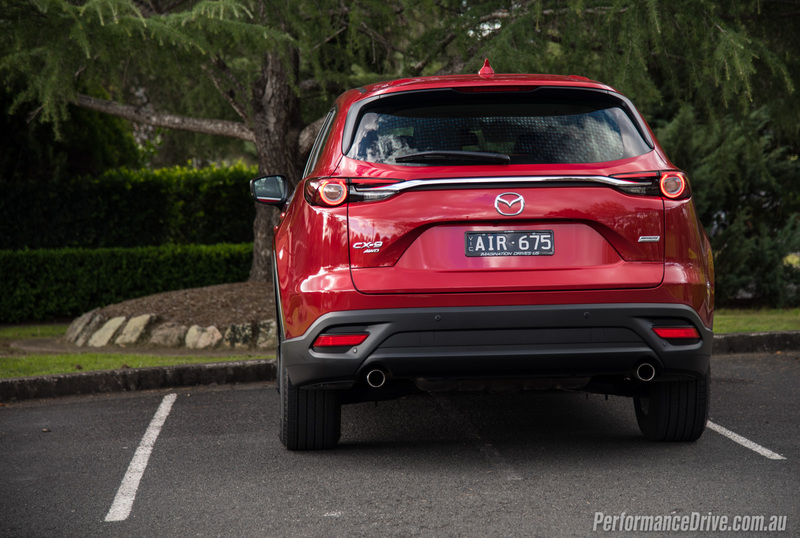 Mazda claims this makes it the most economical non-diesel large SUV in the class, with features like stop-start to help it achieve this. 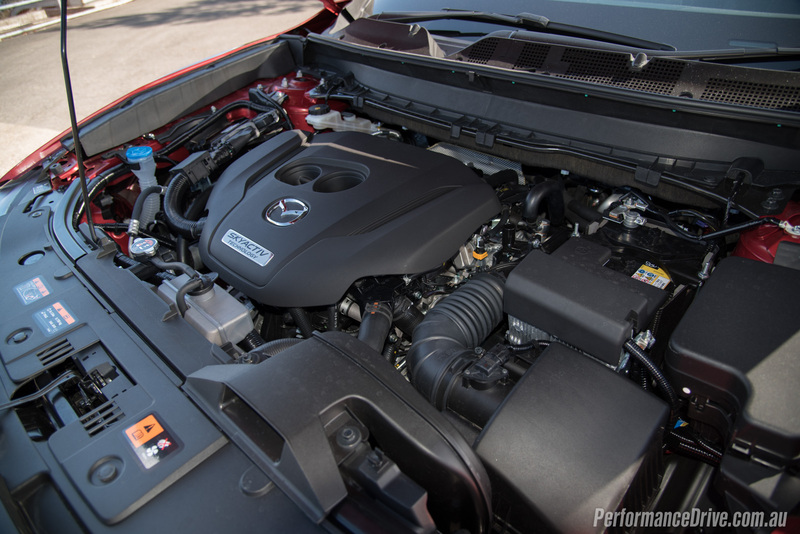 With less power (170kW) but far more torque across a broader rev-range (420Nm at 2000rpm) than the V6 it replaces, the new 2.5-litre SkyActiv turbo motor emphasises low-end flexibility and effortlessness. It also helps to provide two tonnes of boat-pulling ability. How does all this work in the real world? And where does it rank in the field? There are four model grades, starting at $42,490 for the front-wheel drive Sport, and from $46,490 for this Sport all-wheel drive version. 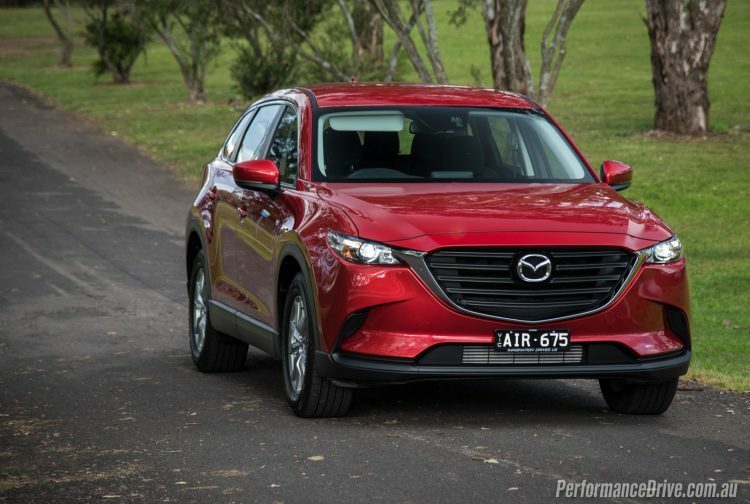 All CX-9 variants feature seven seats across the board, plus a five-star ANCAP rating thanks to a plethora of new active and passive safety features. These include blind-spot alert, city autonomous braking front and rear. 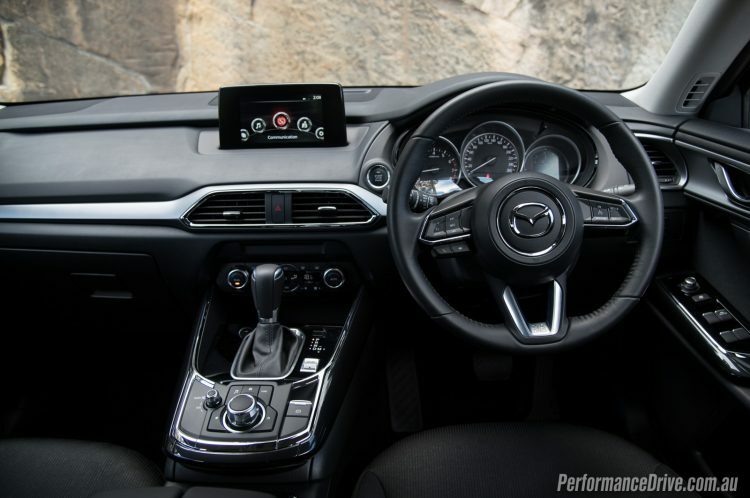 Other standard items include 18-inch alloys, LED lights and Mazda’s brilliant MZD Connect infotainment system including satellite navigation. 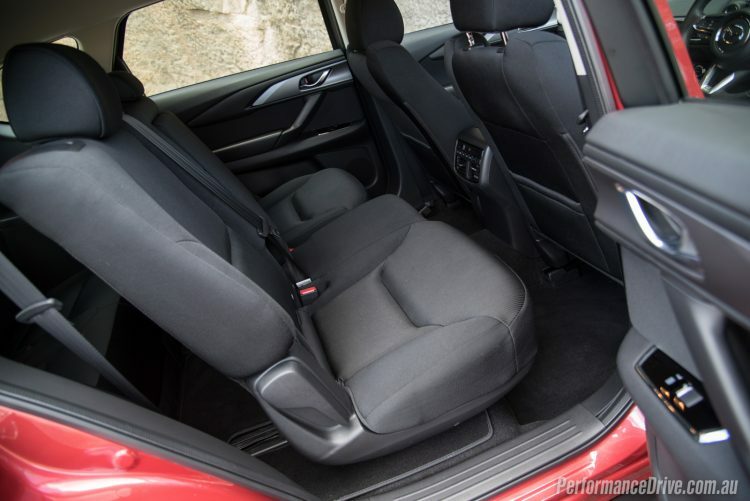 Moving up to the $48,990 Touring adds 20-inch wheels, six-way power front seats, heated leather seats and lumbar support, power tailgate and 8.0-inch infotainment screen. The GT then starts at $57,390 with its 20-inch rims, smart key, remote tailgate, front parking sensors, HUD, DAB+ radio, while the flagship Azami for two grand extra gives you the iACTIVSENSE package which includes adaptive cruise control, forward collision warning, lane departure warning, lane assist, active beams. AWD sets you back an extra $4000 in all variants, from the default front-wheel drive setup. The design is very sporty and this is the theme Mazda has carried throughout the vehicle. In a sea of appliances, the CX-9 stands out as looking premium and desirable in our opinion. The narrow headlights and character lines in particular do wonders for the style and presence. Inside there’s a poor-man’s Porsche Macan-esque aura about it. 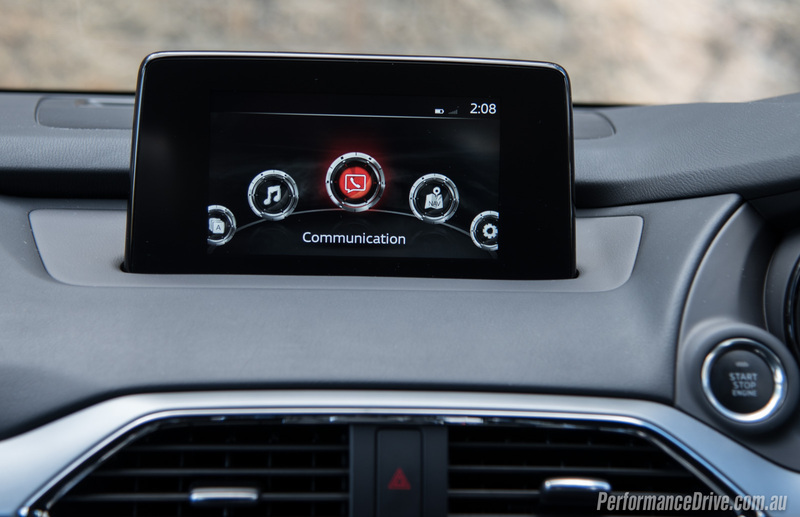 The transmission tunnel sits high, where the infotainment and audio controls sit, but it is rather wide. It would be nice to see space under the black panel for legs to fit under. The instrument binnacle is straight out of the MX-5. 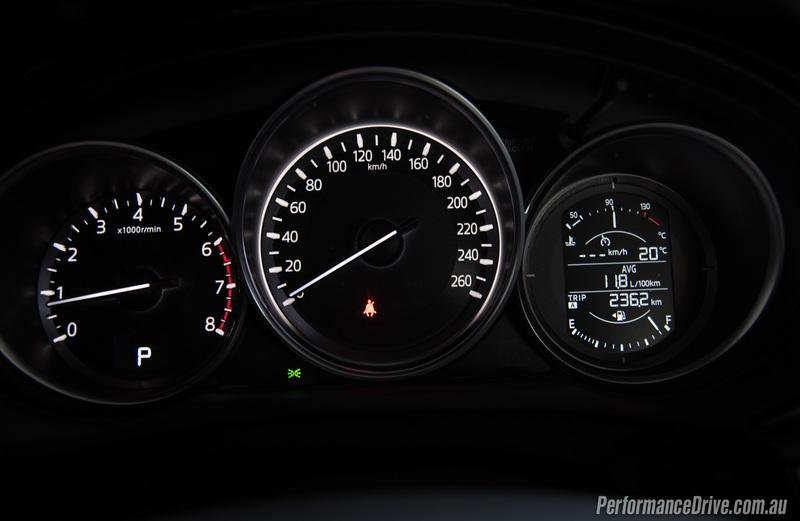 This looks great and is easy to read but a digital speedo would be welcome. 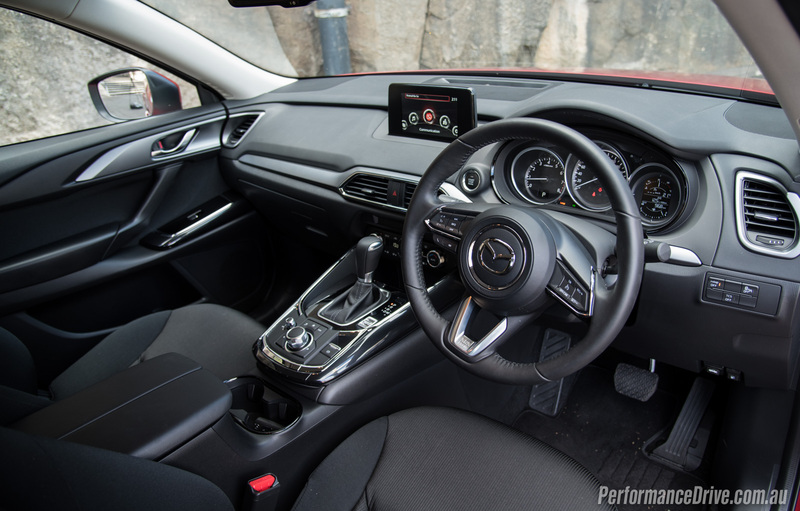 The rest of the cabin feels contemporary and fresh, with easy-to-operate climate control and navigation, and entertainment that can be adjusted on the go with the MZD rotary knob. 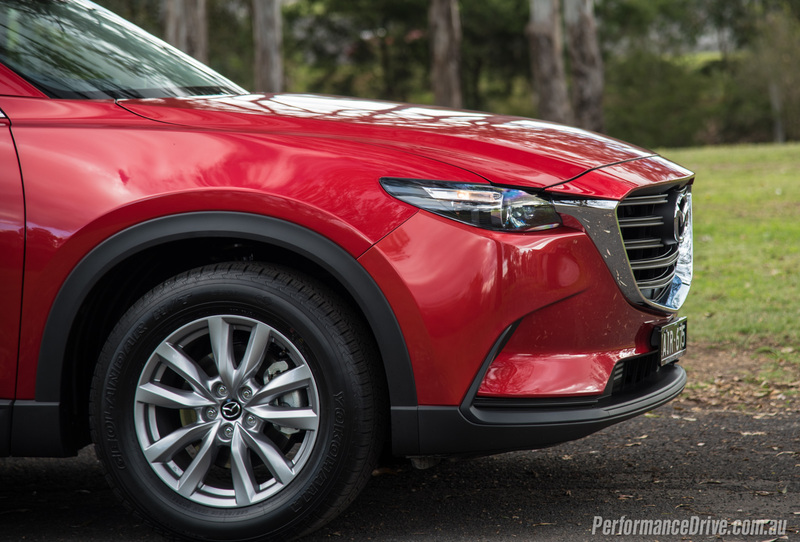 As we’ve said in other Mazda reviews, this is one of the best we’ve seen in an affordable car. Pairing a phone and inputting a destination are possible on the move, and the navigation system is faultless. A racy three-spoke steering wheel with audio and cruise switches is elegant in its simplicity and user-friendliness. 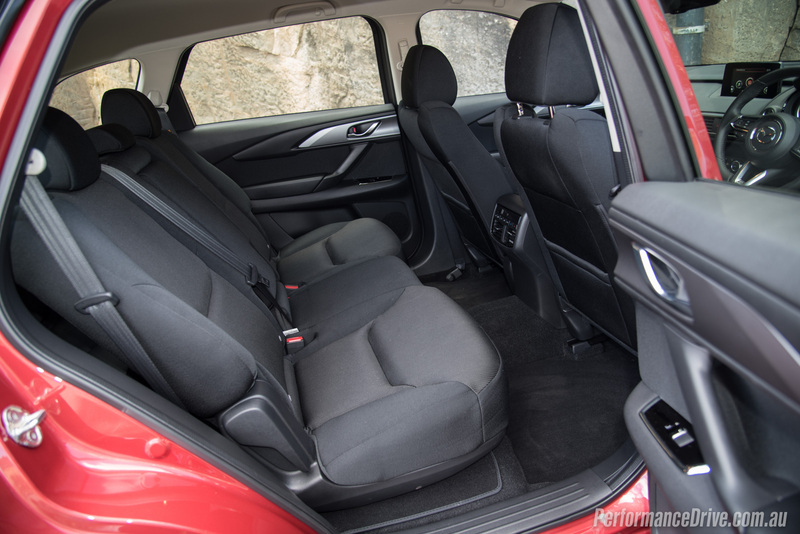 Black cloth seats feel sporty, hard wearing and comfortable. 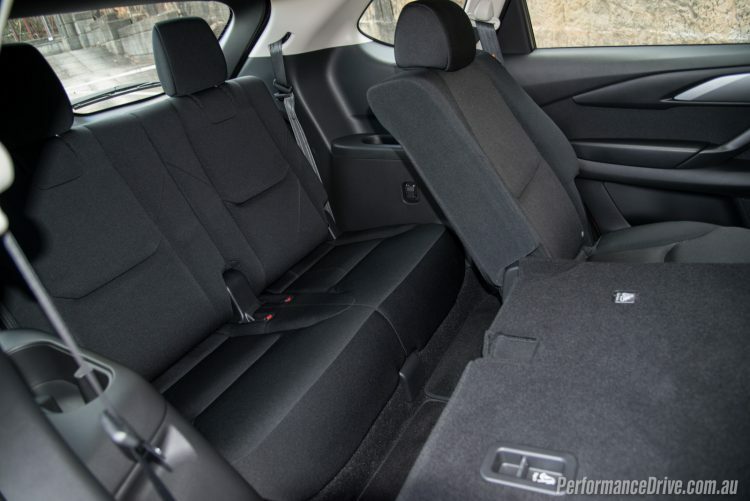 All in all, this is a very user-friendly, premium and sporty-feeling environment. Big ticks here. In terms of accomodation, the first two rows are well up to the task of comfortable touring for large adults. 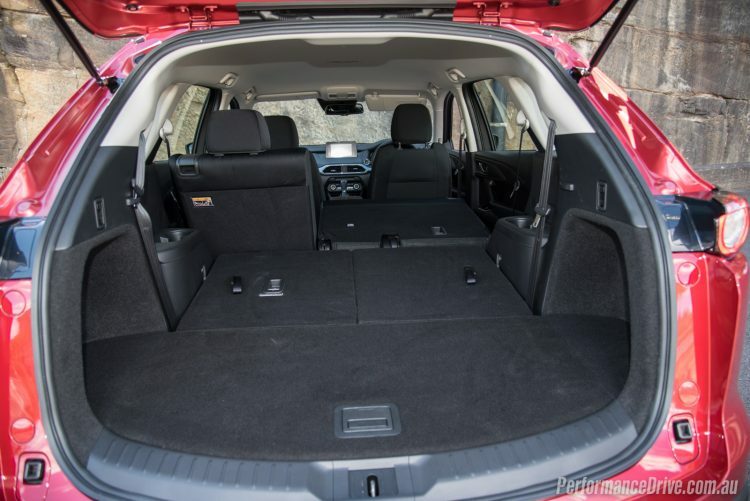 The third row is easy enough to access, but headroom is encroached upon by the sloping roofline, meaning six-footers won’t like long journeys, but an MPV is still the best way to cart three rows of adults in comfort anyhow. The large doors are rather heavy and long, so one must be mindful in car parks. 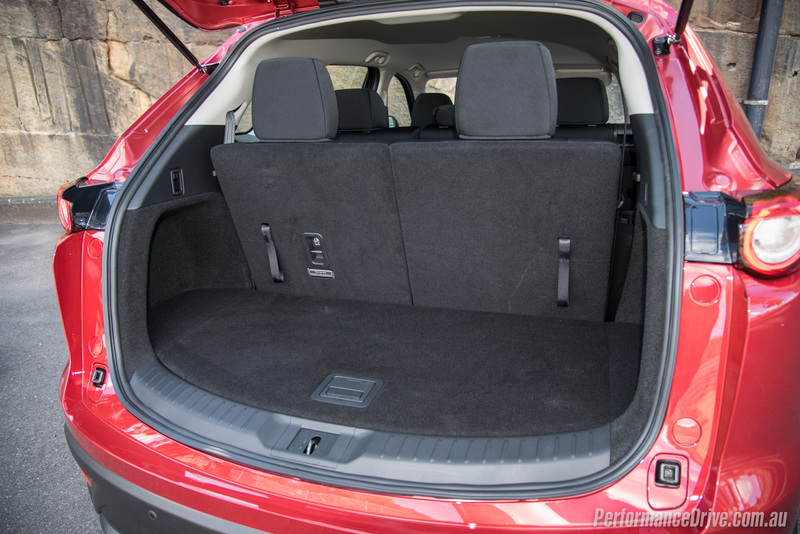 Boot space is generous at 810L with the third row stowed flat, or 230L with it in place. Undernearth sits a full-size spare tyre, albeit steel in our Sport spec. 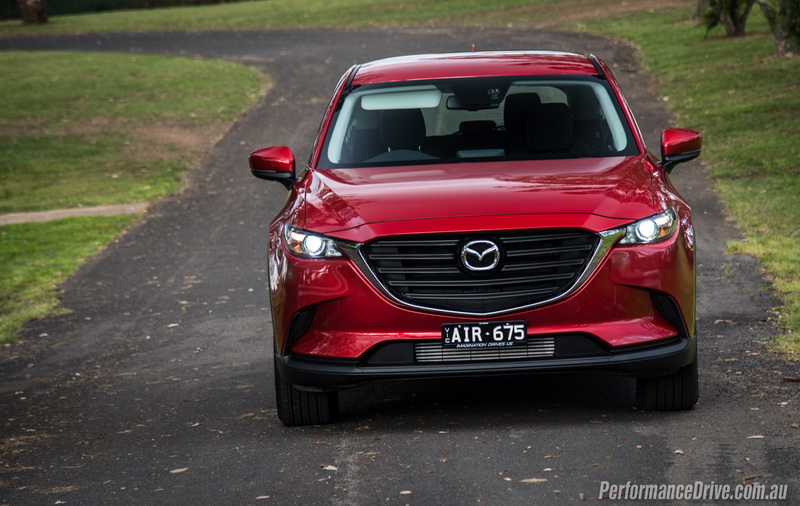 Mazda claims the CX-9 ushers in a new era of quiet Mazdas, with an emphasis on refinement aiming to silence the notion that Mazdas aren’t up to class standards in this area. Many layers of sound deadening have been added and will be used for subsequent models. It has worked a treat. The cabin is isolated at all times from wind noise, engine noise, A-pillar roar and tyre noise. 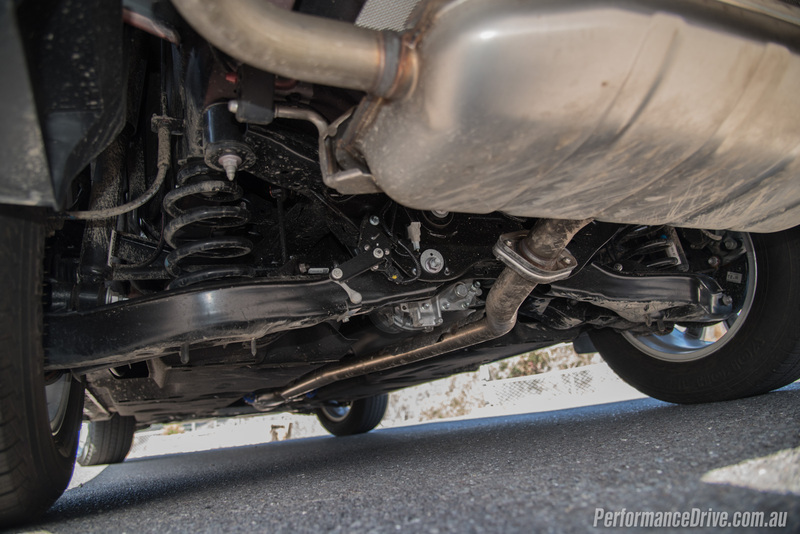 It feels smooth and the suspension is firm but forgiving on all but the harshest of expansion joints. Visibility is great. 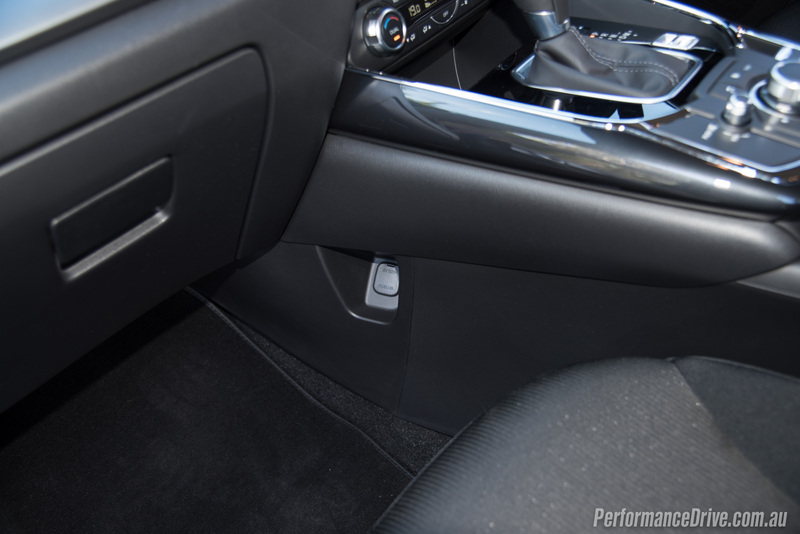 Combined with the immediate torque curve the CX-9 is quite the gap-filler in dense traffic. This also assists in parking, though the absence of front parking sensors is a bumer. Steering is only marginally heavier than a (now defunct) Ford Territory, so it scores high marks here. The engine is responsive and effortless at low revs, even if it doesn’t really have the top-end sparkle of a V6. Sport mode pipes some induction roar through the cabin but it is never scintillating. Still, it is enjoyably rapid most of the time, with 0-100km/h stopping our clock in 7.69 seconds. Lateral grip and weight transfer is well contained, with the steering precise, communicative and well-weighted to tie chicanes together. Oddly enough, we did experience some tugging at the wheel under heavy throttle, making us double check for the AWD badge. 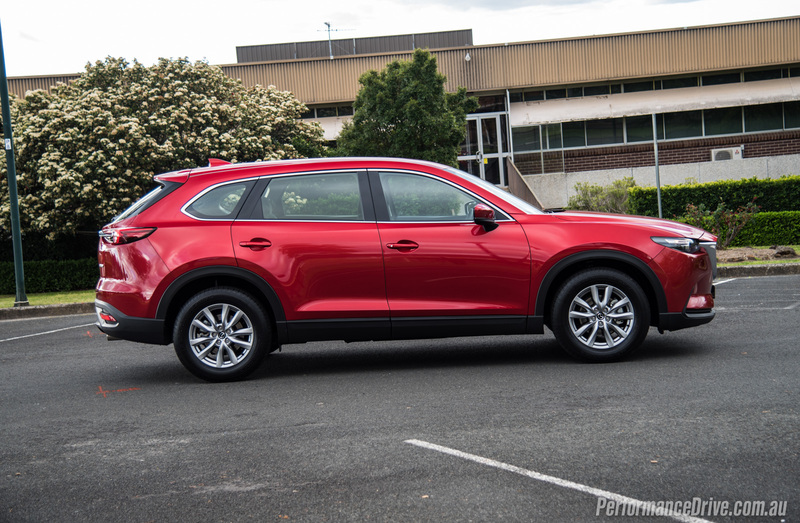 In terms of our question whether the 1865kg CX-9 AWD lives up to expectations of economy, not really. 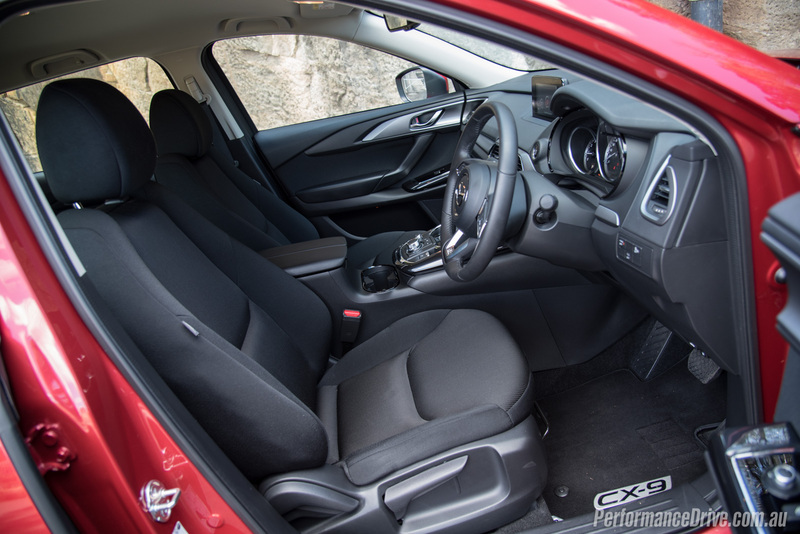 Although the new engine is responsive and does save fuel by switching off at traffic lights, and offers good low-down torque, we saw figures around the 11.0L/100km overall, climbing with a heavy foot. 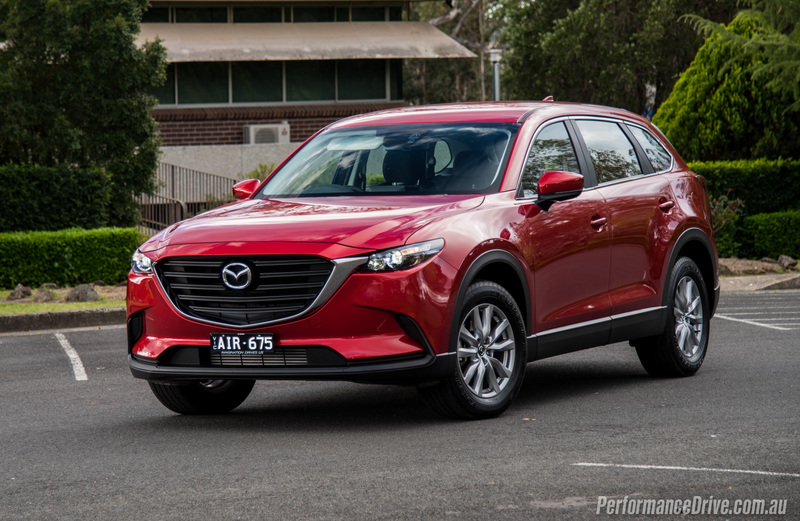 Cruising will see an immediate drop into the low 8s, which is great but ultimately a diesel would make far more sense, if only Mazda could make a business case for a SKYACTIV-D-powered variant. It’s worth nothing the front-wheel option offers a 0.4L/100km saving on the official combined cycle, likely translating to a similar saving in the real world from this AWD model. 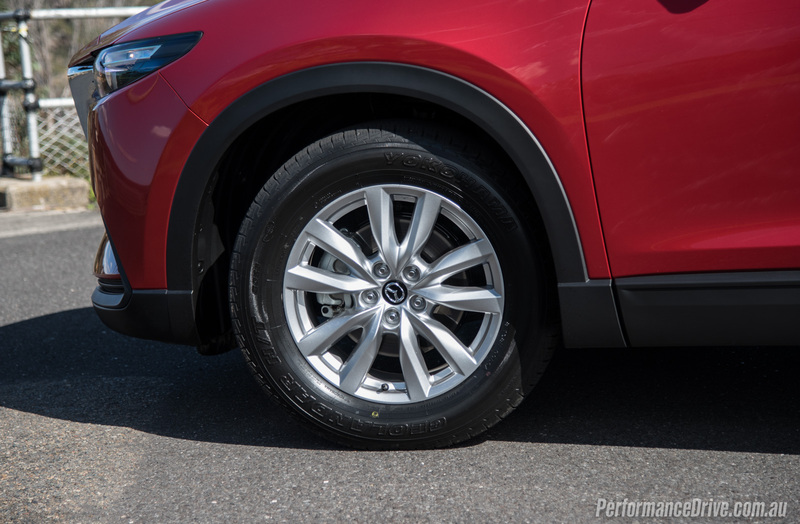 The second-gen CX-9 has been developed with sportiness at its core from the ground up, but also to be extremely comfortable, quiet and refined. 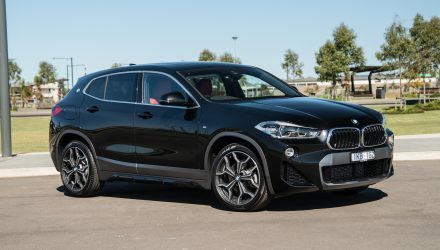 It succeeds admirably on all of those fronts, making it the sportiest and most engaging contender in its class we think. Heavy doors, compromised headroom in the third row and not quite diesel economy are the only blots on an otherwise stellar report card. Some rivals have more equipment for this money (Haval H8). Some have more rear seating room (Kluger) and a diesel Sorento or Santa Fe will save some shrapnel at the fuel pumps, but none of those SUVs feels as aspirational or engaging as the new CX-9 and they all reek of necessity with precious little sense of occasion.